The choice of adhesive depends on the subfloor and working method. 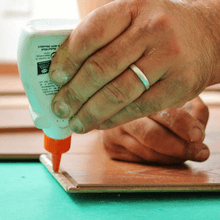 We know that glues are different adhesives and cover different situations. Our range of glues are all exclusively developed for wooden floors. If you are interested in purchasing, or have any questions about which glue is right for you, then please contact one of our branches, and we would be happy to help. D700 adhesive is a solvent-free white wood floor glue and is suitable for gluing various timber materials. These include; tongue and groove joints of engineered flooring, pre-finished parquet, laminate floor coverings or similar materials.